The Town of Pembroke, The Thomas Entrepreneurship Hub, and Thread Capital of the Rural Center, have joined forces to create a $150,000 small business community loan fund. 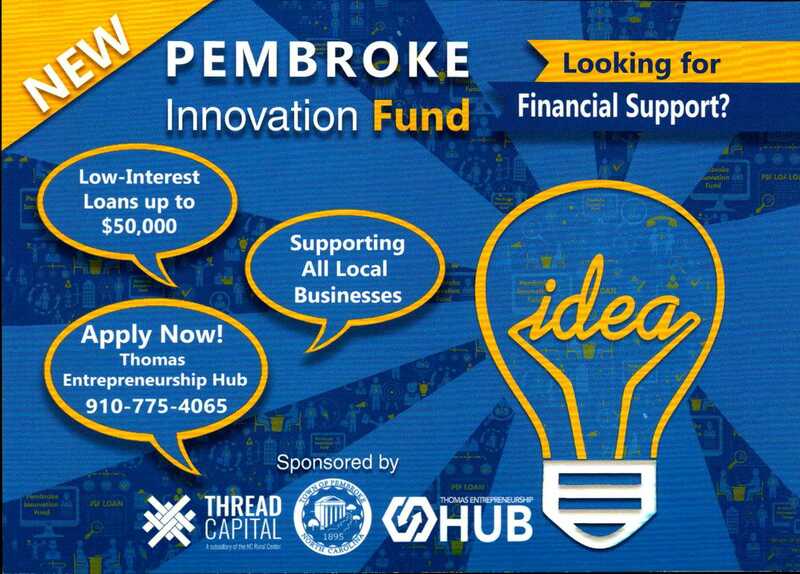 This loan fund, known as the “Pembroke Innovation Fund” works with individuals who have sound ideas for starting or expanding a small business but may have difficulty obtaining a loan from traditional sources. Loan amounts range from $20,000 for start-ups and $50,000 for existing businesses, working capital or expansion. All loans are offered in combination with no-cost business planning and technical assistance from the Thomas entrepreneurship Hub and Small Business Technology Development Center. For more information contact the Thomas Entrepreneurship Hub at 202 Main St Pembroke by calling 910-775-4065 or Tyler Thomas, town manager with The Town of Pembroke at 910-521-9758.